petition: Stop Big Pharma's Plot to Keep Drugs Unaffordable! Stop Big Pharma's Plot to Keep Drugs Unaffordable! Multi-billion dollar corporation Merck has been exposed as a ringleader of a Big Pharma plot in South Africa to keep the cost of drugs — and their own profits — high while keeping medicines out of the hands of millions of people whose lives depend on them. Right now in South Africa, Big Pharma is granted almost every patent they apply for. This means they can keep the costs of drugs for deadly diseases like cancer and tuberculosis out of reach for the people who need treatment. But South Africa is considering reforms that would increase access to low-cost, generic medicines, and better protect public health. Big Pharma's secret strategy is trying to stop these critical reforms from going ahead. Merck, along with more than 20 other multinational pharmaceutical companies, put their profits over the health of millions of people and organized a secret and expensive lobbying effort to maintain the harmful status quo. Following the exposure of Big Pharma's dirty tricks, and after widespread criticism from Doctors Without Borders, the Treatment Action Campaign, SECTION27, and others, several companies have dropped out of the campaign and promised not to interfere with South Africa's patent law reform — but not Merck. Generic medicines are an important part of making sure people can get the treatment they need to survive drug-resistant tuberculosis, HIV, and other deadly diseases. Your company is once again putting profits over people and leading a campaign to keep drug prices high by stopping needed patent law reforms in South Africa. Patents can keep medicines from the people who need them, as the high prices charged by patent-holding companies mean those who cannot afford treatment often go without. In 1998, pharmaceutical companies, including Merck, took the South African government to court, and tried to block the importation of more affordable generic HIV/AIDS drugs in the face of the world's worst HIV/AIDS epidemic. Public pressure at the time helped force the pharmaceutical companies to finally back down in 2001. Subsequent generic competition caused prices to fall dramatically, making treatment possible for people who would otherwise die. 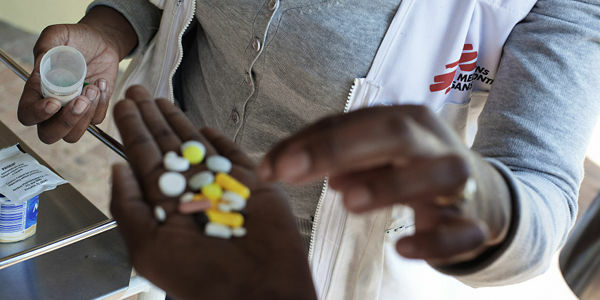 Right now, Doctors Without Borders is affected by high prices of patented drugs in its drug-resistant tuberculosis treatment program in South Africa. Along with local partners Treatment Action Campaign and SECTION27, and a global coalition of supporters, Doctors Without Borders has been pushing for the government to make these important changes that would give more people access to these and other lifesaving medicines they need. On behalf of the millions of lives at stake, I stand with Doctors Without Borders, and a global coalition of organizations to urge Merck to put people before profits. We demand that your company publicly state it will no longer undermine South Africa's patent law reform process, drop your opposition to the internationally recognized laws being proposed by the South African government, and help make medicines more affordable.